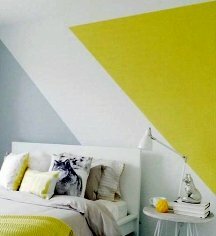 Looking for some unique accent wall painting ideas to take your focal wall to the next level? We've got plenty: from unusual shapes to unexpected placement, keep reading for feature wall project inspiration that will satisfy every taste and work for any room in your home. Painting accent walls has become an almost classic way to add some interest to a plain room, but the following wall painting ideas will restore the freshness of the concept and help you make a real statement with your focal wall. 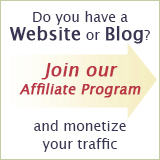 So let's get your creative juices flowing! The backsplash is a perfect place for an accent color if you want to liven up your entire kitchen with minimum effort (a quart of paint and 2 hours of your time). 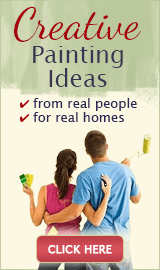 Just make sure you use a glossy paint finish or special washable paint - it's durable and easy to keep clean. Open-face kitchen and bathroom cabinets and those with glass doors almost beg to be accentuated with a different, fun paint color! 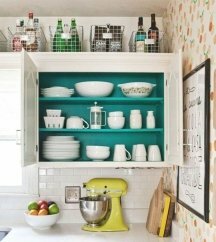 But even if your cabinets have solid doors, an accent pop of color inside can be a nice little surprise (even if just for you) every time you open them up to get something. 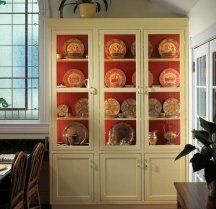 Your dining room china cupboard with the back wall painted a bright color will make all your nice dishes really stand out and showcase your collection (no special lighting needed). So don't be afraid to go bold with your color choice here because only a fraction of it will peek through the open spaces. The back wall of a built-in or free-standing bookcase can also be painted in a contrasting, complementing color to highlight your books and accessories. And you don't have to limit yourself to one accent color only - use 2 similar shades or even multiple colors for different effects. Awkward structural elements such as pipe boxing and protruding wall parts can be made to look intentional and decorative - simply by painting them with an accent color. Now these odd shapes will actually add something to your space, and look interesting and creative. 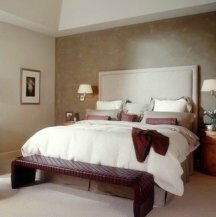 Don't forget about the fifth wall - your ceiling can be a focal point, too! 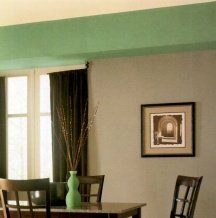 Since this accent color placement is so unexpected, you are guaranteed to WOW anyone who enters the room. 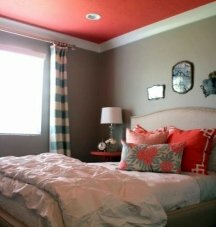 Plus, the right color up there can do a lot for pulling together the entire room color scheme. Accent walls don't have to be painted corner to corner if you want a different look. 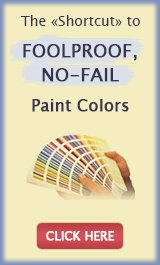 For example, you can paint just the middle section, only the top or bottom part of the wall, fill just 2/3 of it vertically, or paint it in half in any direction. 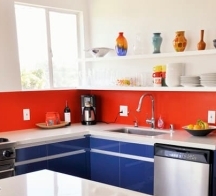 With color blocking, you can slice and dice the focal wall space into as many parts and shapes as you like. This accent wall painting idea can be done in 2-3 or even more colors, in subtle tone-on-tone or very contrasting paint color combinations, and is best suited for contemporary and minimalist home decors. Painted stripes, blocks, circles, triangles and other geometric shapes on a focal wall can really funk up the living space. They can be evenly sized or irregular, done in one or multiple colors, spaced out or overlapping one another, and so on - the possibilities are limited only by your imagination and the effect you are going for. 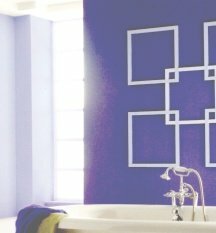 With some blue painter's tape and creativity, you can imitate chair rail, picture frame molding and other decorative trim detail on your feature wall. Simply tape off the desired pattern (it can be a single divider, box shapes or even a criss-cross lettice design) and paint over it with the top coat color. The edges of your accent wall can also be painted to add an extra... well... edge to the effect. They can be made to look scalloped, feathered out and blended into the main wall color, unevenly rugged or even finished off with stripes or stencils - such a small detail but you will be amazed at the difference! Instead of using regular paint and a solid color for painting your accent wall, try a decorative faux finish. For example, venetian plaster will look like polished, light-reflecting stone, antique crackle will infuse some shabby chic flair, and rag painting will imitate the sensual texture of leather. 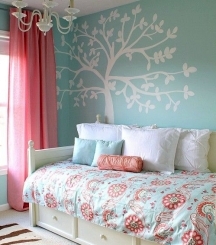 With stencils, you can really make the room come alive! They are available in many different themes to let you create a unique mood and atmosphere. The design can range from a few subtle touches in the corners to frame the wall, to a large-scale mural that will make a bold statement. Consider using a gold, silver or copper leaf finish on your feature wall - the result can be breath-taking (especially when different finishes are combined). 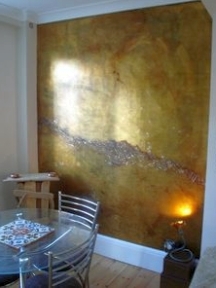 A cheaper, faster and easier way is to use metallic paint - it will look subtler but will still add a dazzle. And finally, pearlized paint looks magical with its understated glow and iridescence when used in a light, tone-on-tone color combination. But perhaps the boldest wall painting idea featured here on this page (definitely not for the faint of anything) is a black accent wall. Most people are afraid of black color and think it'll look goth and depressing. 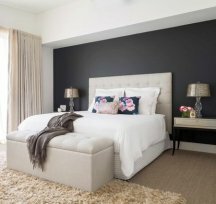 Too bad because when done right (with light color furniture and flooring in the room to balance it out), a black accent wall can look not just stunning, but also fresh, positive and inviting. Here are some more accent wall painting ideas for you to explore - they've been submitted by other visitors to this page, so take a look and don't forget to leave a comment! And if you have your own accent wall painting project to share, click here and see your name in lights.